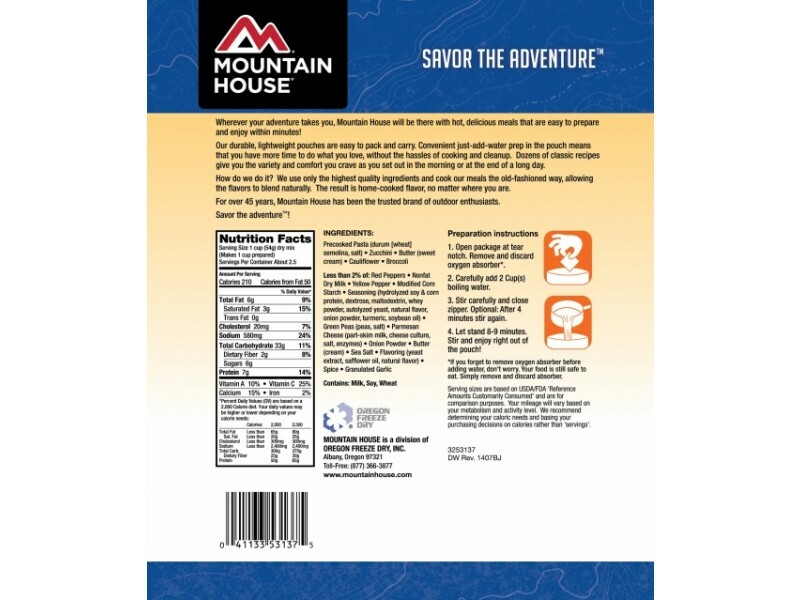 Mountain House pasta primavera is made with great tasting pasta, vegetables and a parmesan cheese sauce that tastes great, and provides you with many important nutrients. It comes in a special pouch that will help ensure it can be stored for ten years, or even longer, on the shelf without a problem. This is a great way to quickly grow your disaster food preparation stockpile, or even to get one started. 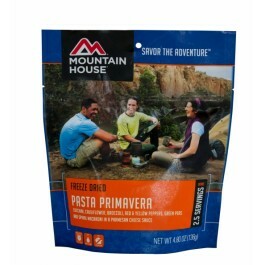 This pasta primavera is a great emergency food, or an item to take with you camping, hiking or anywhere else where you may need some emergency food. 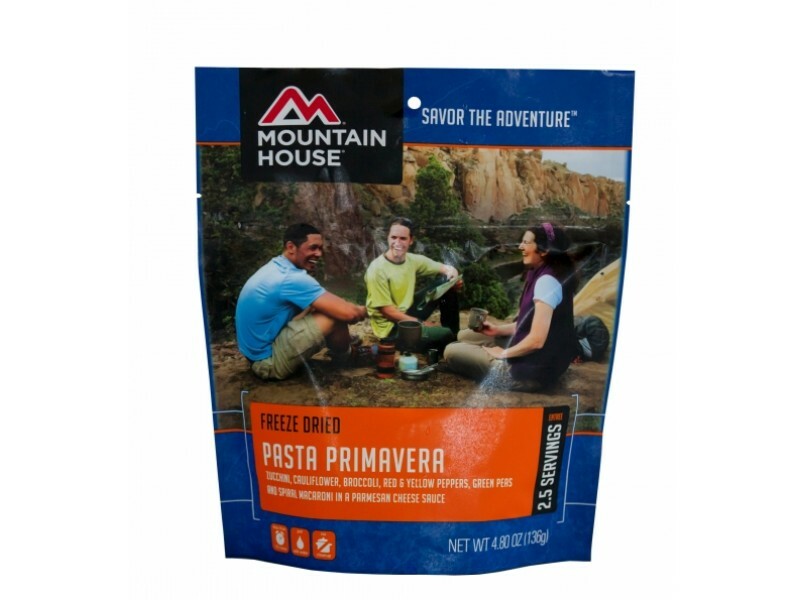 Pasta primavera from Mountain House is a popular choice for those who want to stock up on long shelf life emergency foods. You can store it for ten years or more, and it will still taste great when you’re ready to eat it. When the time comes, preparation is extremely simple and only takes a few minutes. Just open up the pouch and add the instructed amount of hot water. Once you let it sit for a few minutes, you can serve it, or even enjoy it right out of the pouch. Each order comes with 2.5, 1 cup servings. Each serving is packed with 170 calories, 3.5 grams of fat and 6 grams of protein. Calories, protein and fat are all essential for emergency situations because they will keep you feeling fuller, and give you the strength you need to get through anything. Of course, the pasta primavera is also a great tasting dish that everyone will enjoy. Even those with families will likely find that kids love the rich taste of this popular dish. Order yours today so you will have it when you need it. 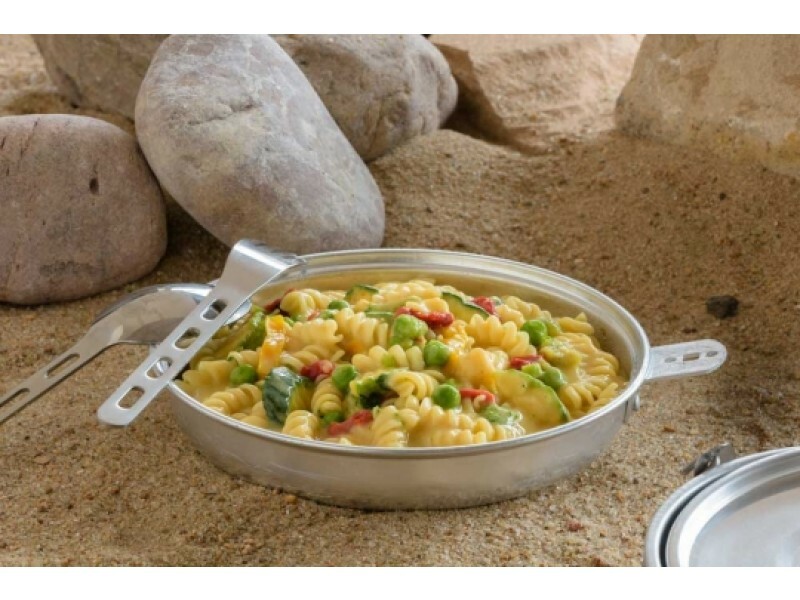 INGREDIENTS: Precooked Pasta (durum wheat semolina), Zucchini, Cream, Cauliflower, Broccoli, Red Peppers, and Contains 2% or Less of Nonfat Dry Milk, Yellow Peppers, Modified Corn Starch, Green Peas, Seasoning (hydrolyzed soy and corn protein, dextrose, torula yeast, soybean oil), Parmesan Cheese (part-skim milk, cheese culture, salt, enzymes), Onion Powder, Butter (cream, salt), Maltodextrin, Sea Salt, Cultured Whey & whey Powder, Autolyzed Yeast Extract, Spice, Granulated Garlic, Natural Flavors, Tumeric, Safflower Oil. CONTAINS: Wheat, Milk, Soy.